bRadiology (W.C., B.C., C.M., P.T. )dWisconsin and University of Wisconsin School of Medicine and Public Health (B.C. ), Madison, Wisconsin. BACKGROUND AND PURPOSE: Arteriovenous malformations have a high lifetime risk of hemorrhage; however, treatment carries a significant risk of morbidity and mortality, including permanent neurologic sequelae. WSS and other hemodynamic parameters are altered in patients with symptomatic AVMs, and analysis of hemodynamics may have value in stratifying patients into different risk groups. In this study, we examined hemodynamic data from patients with stable symptoms and those who presented with acute symptoms to identify trends which may help in risk stratification. MATERIALS AND METHODS: Phase-contrast MRA using a radial readout (PC-VIPR) is a fast, high-resolution technique that can acquire whole-brain velocity-encoded angiograms with scan times of approximately 5 minutes. Ten patients with AVMs were scanned using PC-VIPR; velocity, area, flow, and WSS in vessels feeding the AVMs and normal contralateral vessels were calculated using velocity data from the phase-contrast acquisition. RESULTS: Patients with an asymptomatic presentation or mild symptoms (n = 4) had no significant difference in WSS in feeding vessels compared with normal contralateral vessels, whereas patients presenting with hemorrhage, severe headaches/seizures, or focal neurologic deficits (n = 6) had significantly higher WSS in feeding vessels compared with contralateral vessels. CONCLUSIONS: In this study, we demonstrate that estimates of WSS and other hemodynamic parameters can be obtained noninvasively in patients with AVMs in clinically useful imaging times. Variation in WSS between feeders and normal vessels appears to relate to the clinical presentation of the patient. Further analysis of hemodynamic changes may improve characterization and staging of AVM patients, when combined with existing risk factors. Untreated AVMs present a clinical dilemma because they carry a significant annual risk of intracranial hemorrhage, with associated morbidity and mortality, but current treatment options also carry significant risks. Prognostic information on the risk of rupture of individual AVMs may allow patients who would benefit from definitive treatment to be differentiated from those who can be managed conservatively. In this report, we describe a noninvasive technique for characterizing WSS and other hemodynamic parameters in patients with arteriovenous malformations, and relate these data to the patients' clinical presentation. WSS can be estimated from velocity measurements from PC-MRA, Doppler sonography, and CFD. 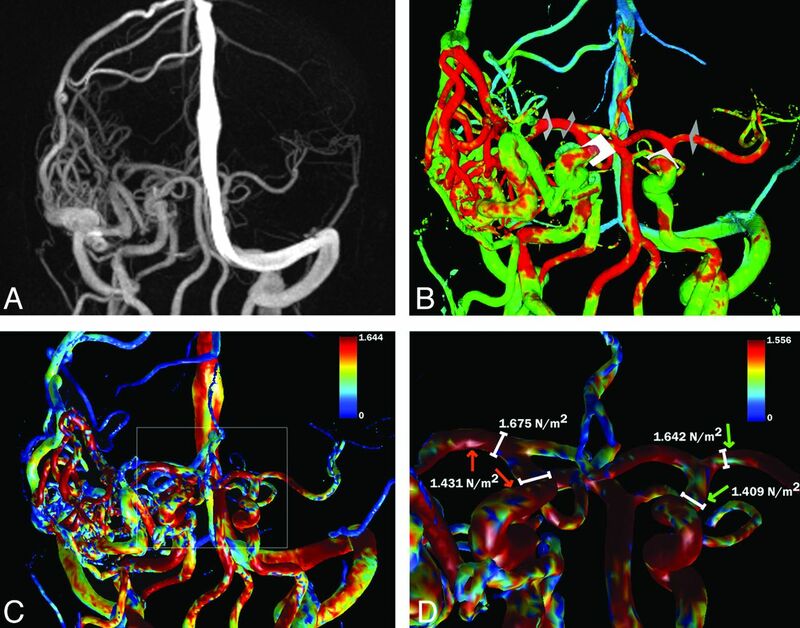 PC-MRA and automated spline interpolation can be used to estimate WSS, but a limitation of prior investigations of WSS using MRA is the lack of sufficient spatial resolution and coverage necessary to visualize the boundary zone and vessels of interest within clinically useful scan times.14 When imaging AVMs, a large field of view that encompasses the entire brain is required to visualize both arterial and venous components. Whole-brain coverage also allows comparison of flow conditions in AVM-feeding arteries with those in normal contralateral vessels. We have implemented a highly accelerated 3D radial phase-contrast MRA technique, called PC-VIPR, capable of acquiring high-resolution PC angiograms of the whole brain with velocity information.15⇓–17 In this study, we use the velocity data from PC-VIPR to estimate WSS and other hemodynamic parameters in 2 groups of patients and relate their hemodynamic profiles to their clinical presentations. The imaging studies were performed in compliance with Health Insurance Portability and Accountability Act regulations and using a protocol approved by the local institutional review board. Ten patients presenting with AVMs were imaged using PC-VIPR. Patients were divided into 2 groups. 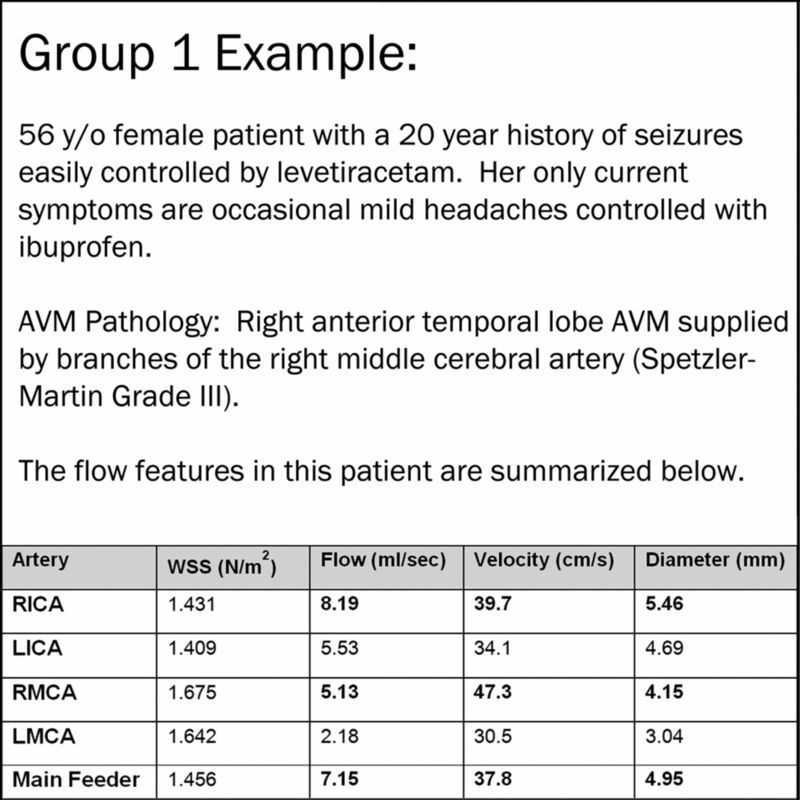 Group 1 (n = 4; 2 men, 2 women; ages 33–56, mean age 42 years) included patients who were asymptomatic with the AVM detected as an incidental finding, or patients who had headaches/seizures that were clinically stable and medically managed. All 4 patients had Spetzler-Martin grade 3 AVMs, with an average size of 3.25 cm. Group 2 (n = 6; 1 man, 5 women; ages 20–47, mean age 37.8 years) included patients who presented with hemorrhage, focal neurologic deficits, or severe or uncontrollable headaches/seizures, who received treatment by surgical resection, radiosurgery, embolization, or combination therapy after the scans were completed. Spetzler-Martin grades of these 6 AVMs ranged from 1–4 (average 2.83), and average size was 2.75 cm. A total of 42 vessels were assessed in group 1, and 58 were assessed in group 2. The vessels of interest were semiautomatically extracted from the imaging volume using commercially available segmentation software (Mimics; Materialise US, Plymouth, Michigan). After segmentation, the velocity data from the PC-VIPR scans were imported into a commercial software product that is designed to measure flow parameters (Ensight; Computational Engineering International, Apex, North Carolina). Cut-planes were then placed in Ensight in the vessels of interest. AVMs were divided into anterior circulation, posterior circulation, or mixed, based on the vessels from which the blood supply was derived. For anterior AVMs, cut-planes were placed in the primary feeders of the AVM, as well as the M1 segment of each MCA and the distal segment of each terminal ICA. For posterior AVMs fed from the basilar artery and PCAs, cut-planes were placed in the primary feeders of the AVM, as well as the midbasilar artery and P1 segment of each posterior cerebral artery. For those posterior AVMs with feeders originating from the PICAs, cut-planes were also made in the vertebral arteries proximal to the PICA takeoff. For mixed AVMs, cut-planes were placed in both anterior and posterior vessels. Fig 1 shows images of cut-planes being placed in the feeder and the MCA/ICA of an anterior circulation AVM, and of points being selected around the MCA of the same patient. A, Cut-planes being placed in vessels feeding a right frontoparietal AVM. B, Points being selected around a vessel feeding the same AVM, and WSS being calculated in a custom Matlab environment. After cut-plane placement, 2D planes were extracted for analysis in a custom Matlab (The MathWorks, Natick, Massachusetts) environment, which tabulated velocity, vessel diameter, WSS, and flow.14,18,19 In this processing chain, vessel boundaries were manually segmented from magnitude images and the flow profile was interpolated using B-splines. Time-averaged flow and mean velocities were calculated directly from the B-spline fit. Average WSS was calculated utilizing the derivative of the interpolated velocity at the wall, averaged over the diameter and cardiac cycle. This 2D technique was used to generate all quantitative WSS and flow measurements in this report. A qualitative WSS measure was also determined by automatic 3D segmentation of the vessel boundary utilizing thresholding of the PC-MRA images. In 3D, second-order polynomials were used to fit the velocity at the wall. Whole-brain surface-rendered WSS maps were determined from the derivative of the second-order polynomial at the wall. 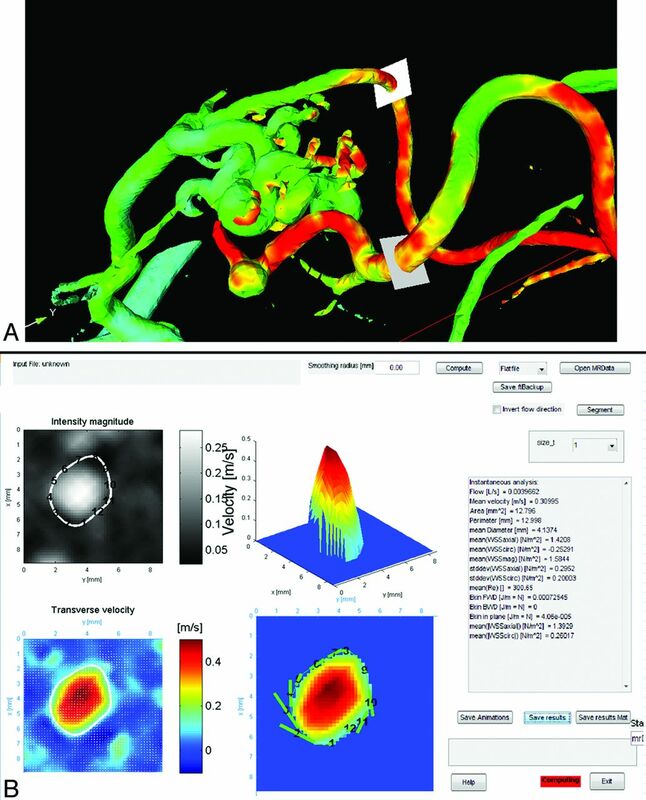 These 3D maps were used to evaluate global differences and trends in WSS.14 Fig 2A, -B show sagittal MR and digital subtraction angiograms of a left thalamic AVM, and Fig 2C shows a qualitative WSS map of the AVM generated using polynomial analysis, showing increased WSS in feeding vessels and in the arterialized draining vein. A, Sagittal maximum intensity projection of a complex difference image acquired using PC-VIPR, showing a left thalamic AVM, arterial feeders, and the AVM nidus. B, DSA angiogram of the same AVM for comparison, showing contrast flow through feeding vessels. C, WSS map of the AVM generated from velocity data from PC-VIPR, showing increased WSS in feeding vessels and in the arterialized draining vein (arrows). A 2-sample t test for independent samples was conducted to compare the mean WSS, velocity, flow, and vessel diameter of vessels feeding AVMs to normal contralateral vessels. A P value of .05 was considered statistically significant. Group 1 patients had an average WSS of 1.555 N/m2 in ipsilateral vessels feeding the AVM and a WSS of 1.494 N/m2 in normal contralateral vessels. A 2-sample t test found no significant difference between the 2 values, with a P value of .31. Group 2 patients had an average WSS of 1.607 N/m2 in ipsilateral vessels feeding the AVM and a WSS of 1.146 N/m2 in normal contralateral vessels. A 2-sample t test found a significant difference between the 2 values, with a P value of .003. Group 1 patients had significantly larger average vessel diameter (4.57 mm compared with 3.66 mm) in vessels feeding the AVM compared with normal contralateral vessels (P = .005), while group 2 patients had a larger diameter as well (4.34 mm compared with 3.84 mm), but the difference was not statistically significant (P = .11). Both group 1 and group 2 patients had increased mean time-average velocity in ipsilateral feeding vessels compared with normal contralateral vessels (41.3 versus 31.1 in group 1; 41.7 versus 29.6 in group 2), and the difference was statistically significant in both cases (P = .001 and P = .009, respectively). Both group 1 and group 2 patients had increased flow in ipsilateral feeding vessels compared with normal contralateral vessels (6.23 versus 3.82 in group 1; 4.57 versus 3.32 in group 2), and the difference was, again, statistically significant in both cases (P = .005 and P = .026, respectively). The results are summarized in the Table. An example of a group 1 patient is presented in Figs 3 and 4. 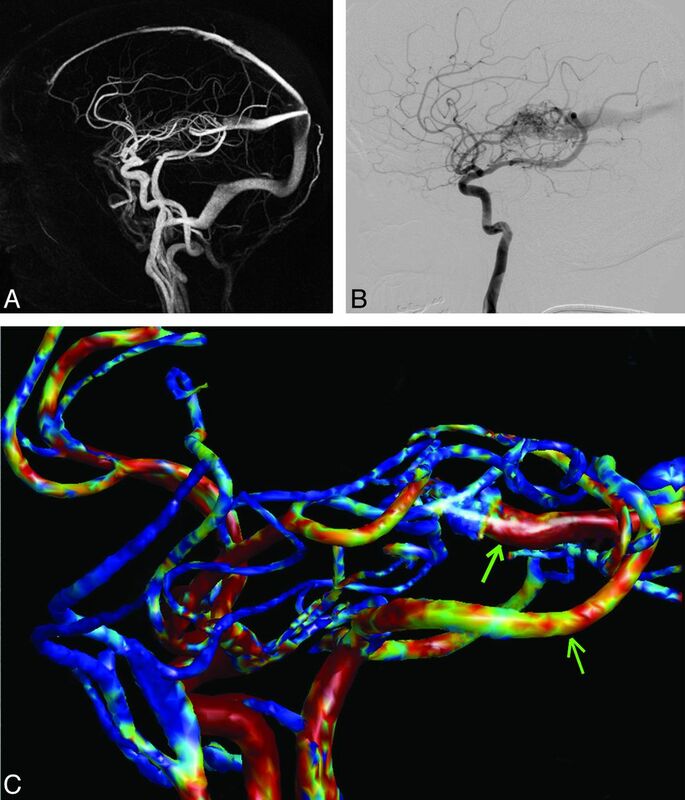 Fig 3 summarizes this patient, who had a right temporal AVM fed from the anterior circulation and had clinically stable symptoms that have been medically managed since her diagnosis in 1990. Fig 3 shows hemodynamic data from this patient, showing similar WSS but increased flow, velocity, and vessel caliber. Fig 4A shows a coronal maximum intensity projection of a complex difference image acquired using PC-VIPR to establish the orientation of the AVM, and Fig 4B shows a velocity image of the whole brain. Note the increased diameter of the ICA/MCA on the right (ipsilateral to AVM) compared with the left side. Fig 4C shows a WSS map of the whole brain calculated from PC-VIPR velocity data, and Fig 4D shows a detailed velocity map of the circle of Willis. Note similar WSS in the MCA and ICA of right-sided vessels compared with the left side. Profile of a group 1 patient. A, Maximum intensity projection of a complex difference image acquired using PC-VIPR, showing a right temporal AVM. B, Velocity image of the right temporal AVM, showing cut-planes being made in arterial feeders and normal contralateral vessels. C, WSS map of the whole brain, showing similar WSS but increased diameter in feeding vessels compared with normal contralateral vessels. D, Detail WSS map showing the circle of Willis and WSS measurements in feeding vessels; note similar WSS values in feeders compared with contralateral normal vessels. An example of a group 2 patient is presented in Figs 5 and 6. 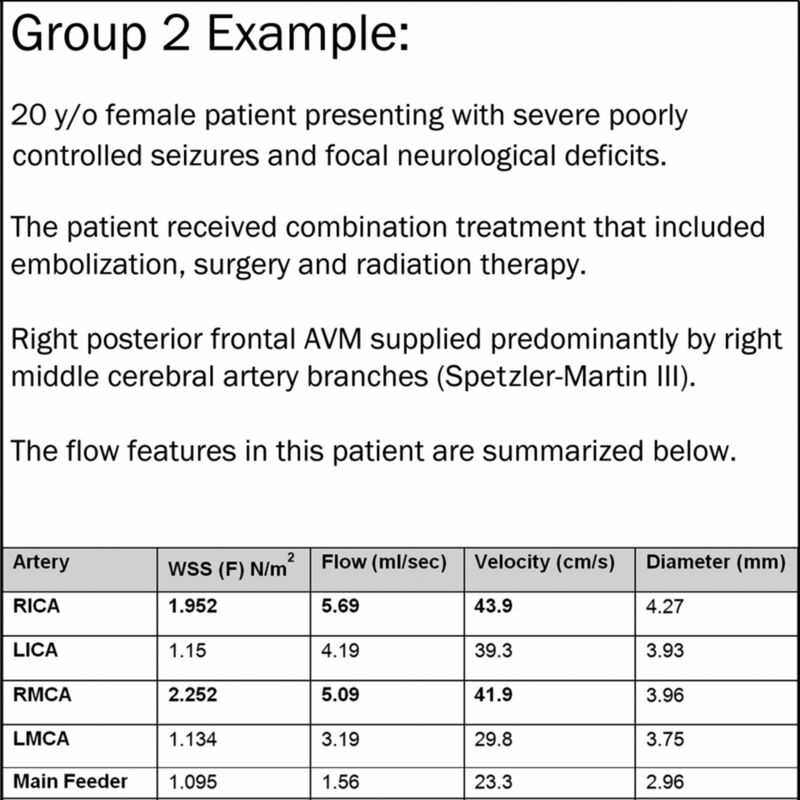 Fig 5 summarizes this patient, who had a right frontoparietal AVM fed from the anterior circulation, and had focal neurologic deficits as well as severe headaches/seizures. Fig 5 shows hemodynamic data from this patient, showing similar vessel caliber but increased WSS, flow, and velocity. Fig 6A shows a maximum intensity projection of a complex difference image acquired using PC-VIPR to establish the orientation of the AVM, and Fig 6B shows a velocity image of the whole brain. Note similar diameter of the ICA/MCA of the right (ipsilateral to AVM) compared with the left side. Fig 6C shows a WSS map of the whole brain, while Fig 6D shows a detailed WSS map of the circle of Willis; note increased WSS in the MCA and ICA of right-sided vessels compared with the left side. Profile of a group 2 patient. A, Coronal maximum intensity projection of a complex difference image acquired using PC-VIPR, showing a right frontoparietal AVM. B, Velocity image of the right frontoparietal AVM, showing cut-planes being made in arterial feeders and normal contralateral vessels. C, WSS map of the whole brain, showing similar diameter but increased WSS in feeding vessels compared with normal contralateral vessels. D, Detail WSS map showing the circle of Willis and WSS measurements in feeding vessels; note increased WSS values in feeding arteries (red arrows) compared with contralateral normal vessels (green arrows). Our pilot clinical study examined 10 patients with AVMs. The group 1 patients (n = 4) presented either with no symptoms (AVM discovered as an incidental finding) or mild, stable symptoms amenable to medical management. The group 2 patients (n = 6) received treatment after presenting symptomatically with hemorrhage, neurologic deficits, or severe headaches/seizures. Both groups had increased flow in vessels feeding the AVM compared with normal contralateral vessels, and this difference was statistically significant. This is expected, as AVMs are generally high-flow environments, because of the lack of a resistive capillary system. Both groups had larger diameter in feeding vessels compared with normal contralateral vessels, but the difference was only statistically significant in group 1 patients. We found no statistical difference between WSS in vessels feeding AVMs compared with normal contralateral vessels in group 1, while group 2 had higher WSS in feeding vessels than normal contralateral vessels, and this difference was statistically significant. The differences in hemodynamics in the 2 groups may have clinical significance, because group 2 patients, who presented with severe symptoms, focal neurologic deficits, or ICH, had higher levels of WSS in feeding vessels compared with normal contralateral vessels. They also exhibited less arterial dilation than group 1 patients. Higher WSS in feeding vessels in these patients may put them at higher risk of hemorrhage, as compensatory dilation of the feeding vessels normalizing shear stress and circumferential strain may not yet be completed. We believe that, when combined with existing methods of risk evaluation, hemodynamic analysis has clinical potential in improving the identification of patients at higher risk of intracranial hemorrhage. While the standard of care for patients presenting with signs of hemorrhage and significant risk factors is timely treatment, there is less consensus on the best course of action for asymptomatic patients with unruptured AVMs. A retrospective study from Scotland29 identified a higher hazard ratio in the intervention group compared with the group that was conservatively managed with supportive care only. These findings and others have prompted large-scale prospective trials such as the ARUBA trial.30,31 Given the uncertain outcomes in evaluating asymptomatic patients without significant risk factors, a better understanding of which AVMs carry an increased risk of hemorrhage may help identify patients who would benefit from definitive treatment and those in whom observation is an acceptable alternative. In a study conducted using Doppler sonography, Rosseti and Svendsen found that arterial feeders to AVMs have similar WSS compared with normal contralateral arteries, despite having larger diameters and velocities.32 They hypothesized that the increase in vessel caliber was secondary to increased WSS stimulating vessel dilation, which normalizes WSS. Therefore, patients in whom WSS is similar in AVM feeders, compared with normal contralateral vessels, may have already compensated for high feeder WSS, while patients who have a differential between feeders and contralateral vessels may not yet have completed compensatory changes, and their vessels may be subject to higher strain. Therefore, analysis of hemodynamic parameters such as WSS may have promise in stratifying patients, by defining the regional hemodynamic conditions associated with the AVM. Several techniques are currently used in the assessment of intracranial WSS. 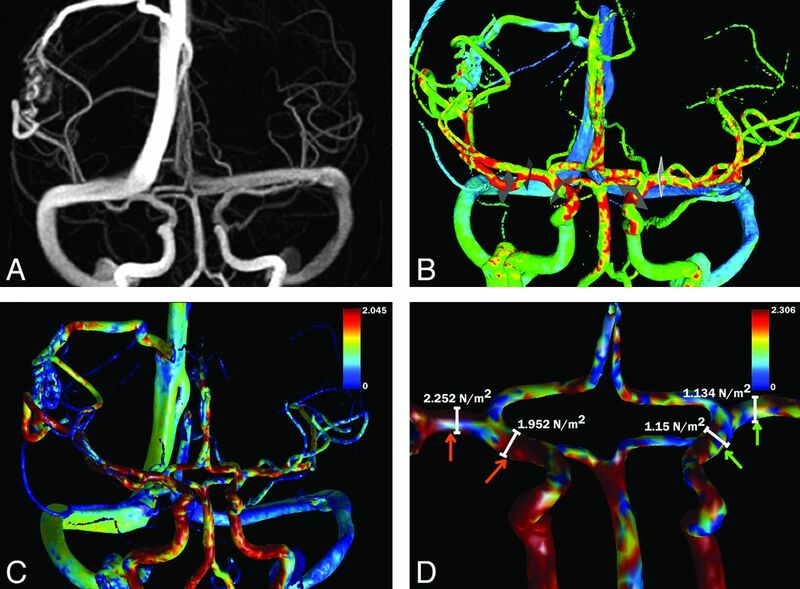 While there is no reference standard for WSS measurement, computer simulations using CFD are considered the best method currently available for the estimation of WSS in the neurovasculature.33 However, the use of CFD in arteriovenous malformations is very problematic, due to the propensity of AVMs to recruit arterial feeders from numerous arterial territories, and their complicated venous drainage pattern and geometry, which makes assumptions about boundary conditions and inputs/outputs very challenging. Intracranial sonography is also used for WSS calculations, but the sonic properties of the cranial vault allow a limited field of view, and sonography measurements are also very operator dependent. Highly accelerated PC-VIPR has the advantage of direct in vivo measurements of velocity from the phase-contrast component and markedly faster scan times, with higher spatial resolution compared with other 4D techniques.27,31 PC-VIPR also captures a 220-mm field of view, which includes the entire brain and the carotid and vertebral systems, and can evaluate both arterial supply and venous drainage of AVMs. This is a significant advantage compared with other angiographic techniques, especially when imaging arteriovenous malformations, which can be very large in size. Velocity measurements from PC-VIPR have been validated by comparison with reference standards such as sonography and 2D PC-MRA. WSS calculations and calculations of derivatives such as velocity and streamlines have demonstrated clinical value in assessing areas of complex flow.34⇓⇓–37 Hemodynamic values measured using endovascular catheters in animal models have shown a strong correlation with values acquired using PC-VIPR.37⇓–39 The WSS computational model used in this study has also been previously validated.27 We feel that, despite the challenges inherent in the assessment of hemodynamics of AVMs, including complicated geometry, large size, and necessity of high spatial resolution, PC-VIPR is an effective technique in the assessment of these complicated neurovascular lesions. A significant limitation of this report is that true WSS is impossible to measure in vivo. WSS values reported in this study are only estimates. Compared with CFD or sonography, phase-contrast techniques such as PC-VIPR have limitations in assessment of velocity at the boundary zone near the vessel wall due to lower spatial resolution. However, creating flow models of AVMs is problematic for CFD due to the complex vascular morphology and geometry. Transcranial Doppler Ultrasound is not well suited for AVM flow analysis because of the limited number of vessels that can be reliably imaged through the temporal acoustic window. Thus, PC-VIPR represents a good option for assessing both the anatomy and hemodynamics of AVMs due to adequate spatial resolution, fast scan time, acquisition of velocity information, and large field of view. One further limitation of this study is that both the hemodynamic data and clinical picture of patients in our studies represent the clinical presentation and flow conditions at only 1 point in time. Long-term study of hemodynamics in this patient group will be necessary to determine the efficacy of hemodynamic analysis in risk stratification. However, we believe the data presented in this report illustrate the promise of hemodynamic analysis in the evaluation of this patient population. We intend to combine hemodynamic analyses with existing risk-factor analysis techniques to create a multivariate model that may offer an improvement in risk stratification. AVMs present a clinical challenge to clinicians because of their high lifetime risk of hemorrhage and concomitant risks of morbidity and mortality from current treatment options. Stratifying patients into different risk categories may help prioritize treatment for patients who are at highest risk of hemorrhage. WSS is a parameter that is altered in AVM patients. We demonstrate that hemodynamic features such as WSS can be estimated in patients with AVMs in a noninvasive manner and within clinically useful imaging times using accelerated phase-contrast MRA. Hemodynamic data acquired in this study appeared to relate to the clinical presentation of 2 separate groups of patients. Estimates of WSS may improve the characterization and staging of AVMs by demonstrating altered hemodynamics. We would like to acknowledge the advice and support of Michael Markl, PhD, and Auerlein Stalder, PhD, who provided one of the software tools we used for hemodynamic analysis. In addition, we greatly appreciate the advice provided by Alex Frydrychowicz, MD, regarding intracranial hemodynamics, and the assistance of Kari Pulfer in patient recruitment. Research supported by NIH R21 EB00944. Accepted after revision October 31, 2011.